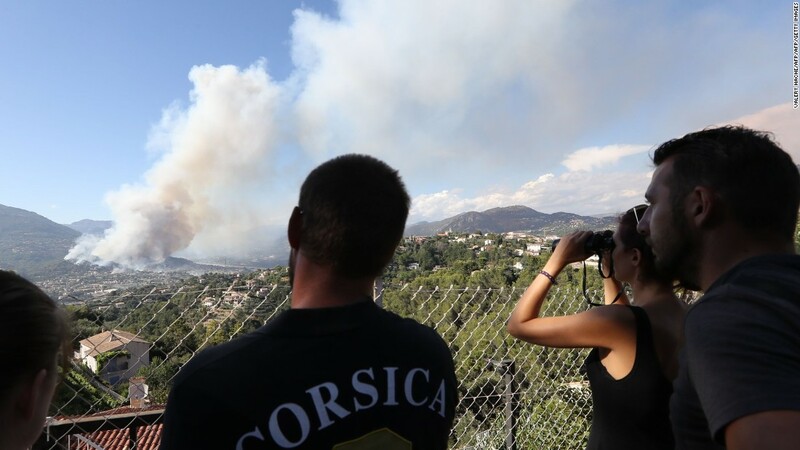 (CNN) Parts of the French Riviera were evacuated late Tuesday and into Wednesday as forest fires burned swathes of land and threatened thousands of people, according to local police. 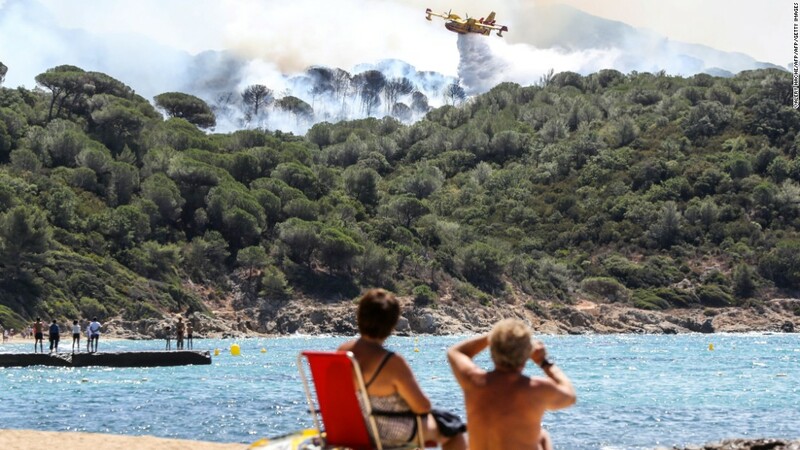 More than 10,000 residents and tourists were moved after a forest fire started near the coastal commune of Bormes-les-Mimosas, around 40 km (nearly 25 miles) from Toulon, one of the country’s southernmost towns. 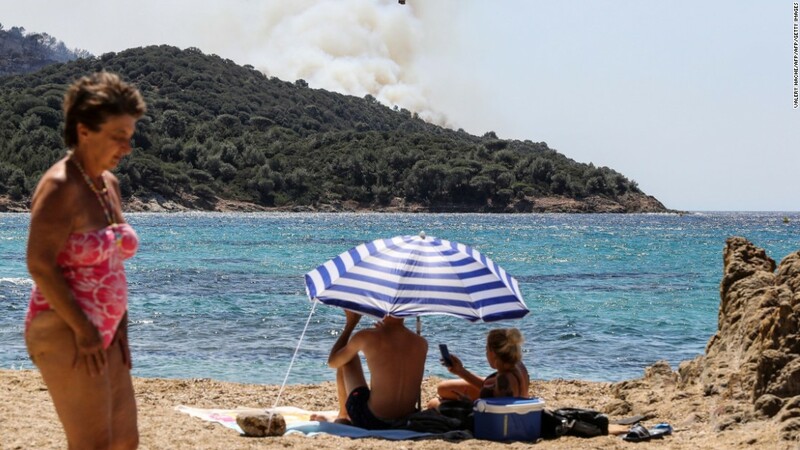 Sunbathers lounging on a beach near Saint-Tropez looked on as a wildfire raged nearby. Children played in the sand, while others snapped pictures on their phones, as flames engulfed pine trees and sent plumes of black smoke billowing overhead. 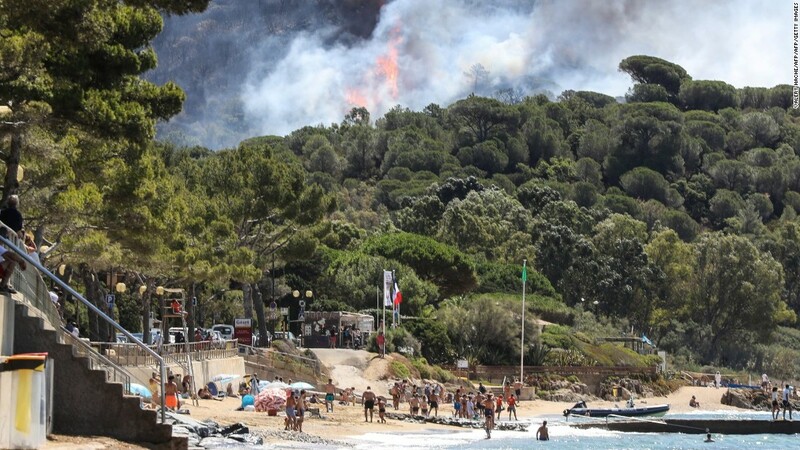 A combination of strong winds, high temperatures, and a lack of rain have fueled the fires, which took hold in the French Riviera and on the island of Corsica, off the southern French coast. Similar conditions have sparked blazes in Portugal and Italy. Paul Adriaansens, a tourist visiting from Antwerp, said he was having lunch with his family on the beach in La Croix-Valmer on Wednesday when the wind changed. They rushed back to their rental house to beat the blaze. “We are fully packed and ready to go the minute we need to,” Adriaansens told CNN in a phone interview. “As soon as we see flames we’ll get out.” The conversation was cut short as police and firefighters arrived to evacuate Adriaansens’ family. Travel pictures shared by tourists on social media captured firefighting planes circling over sandy beaches and pink sunsets punctuated by smoke clouds. 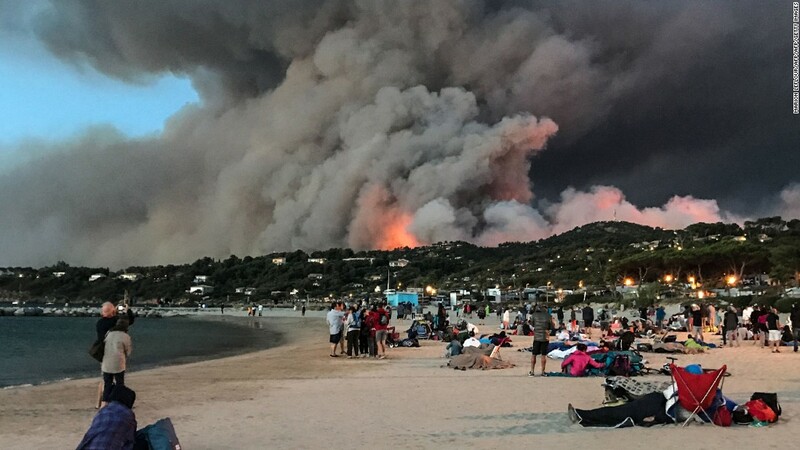 Anna Tomlinson, a British tourist, shared a photo on Instagram of the sunrise in Bormes-les-Mimosas, a village in Var, after what she said was an “intense morning.” Tomlinson was evacuated from her campsite at around 3 a.m. and spent the next several hours watching from a nearby beach as firefighters battled the blaze, according to her post. 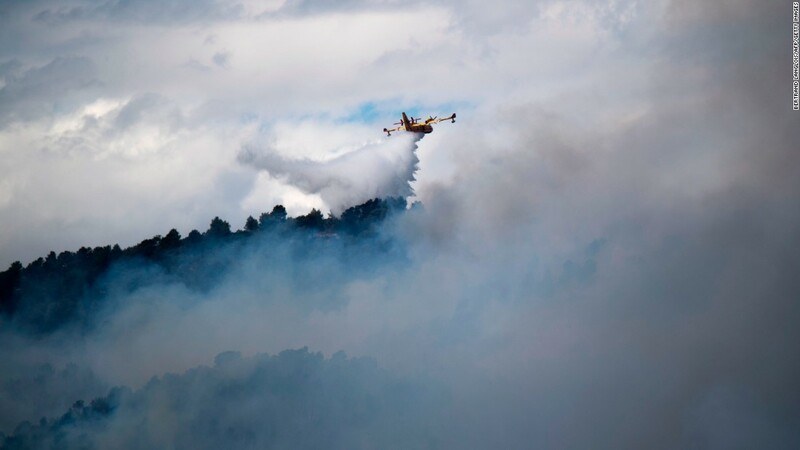 Over 100 firefighting operations have been launched since the blazes broke out, with planes flying over the Bormes area since early Wednesday morning, dropping water bombs on the wildfires. 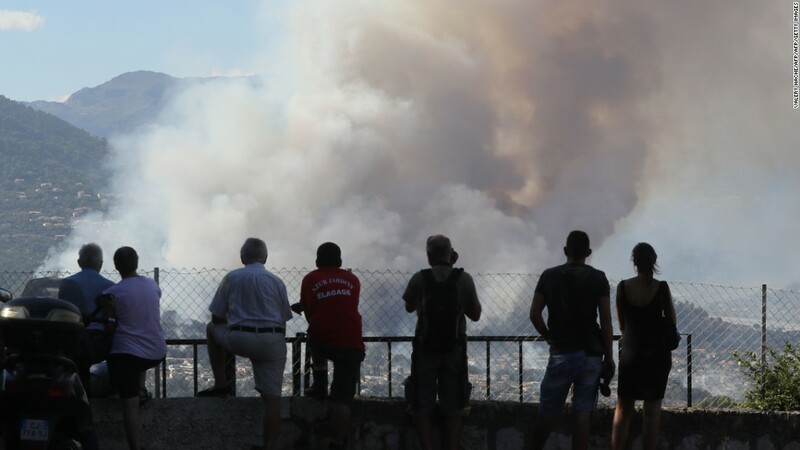 Around 3,000 campers were among those evacuated from Bormes, La Londe, and La Lavandou, the prefecture of Var said in a statement. 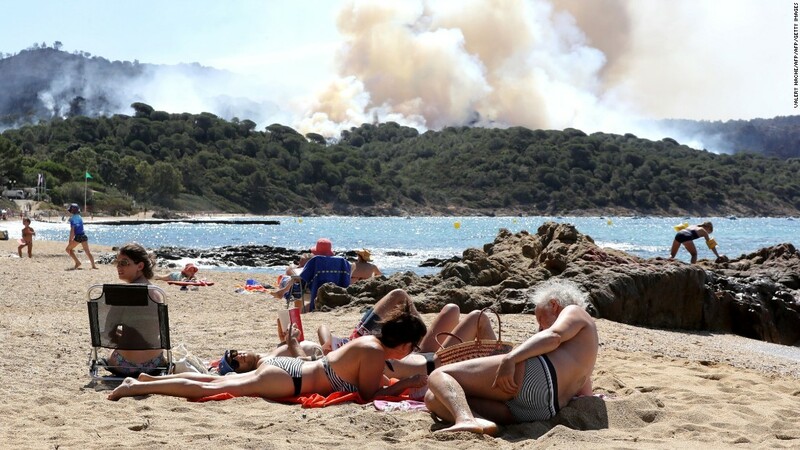 Many ended up sleeping on the beach at Cap Bnat, a rocky peninsula in Bormes-les-Mimosas, as smoke rose in the distance. 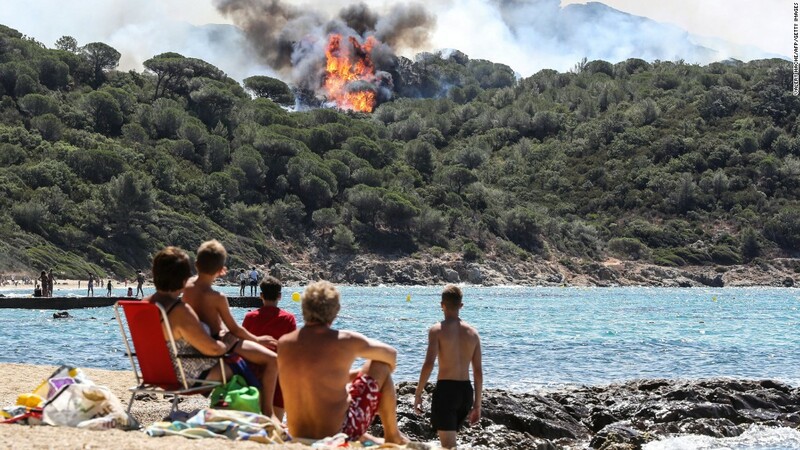 Matthieu Dany, a 23-year-old French designer who has been coming to the area for vacations since he was a child, says he’s never seen fires like this. “Almost everyone on the beach was looking to the hills, taking photos and videos of the fires,” he added. Late July and August are when many French residents head out “on holiday,” and visit the Riviera (or the Cte d’Azur, as the Riviera is known in French). 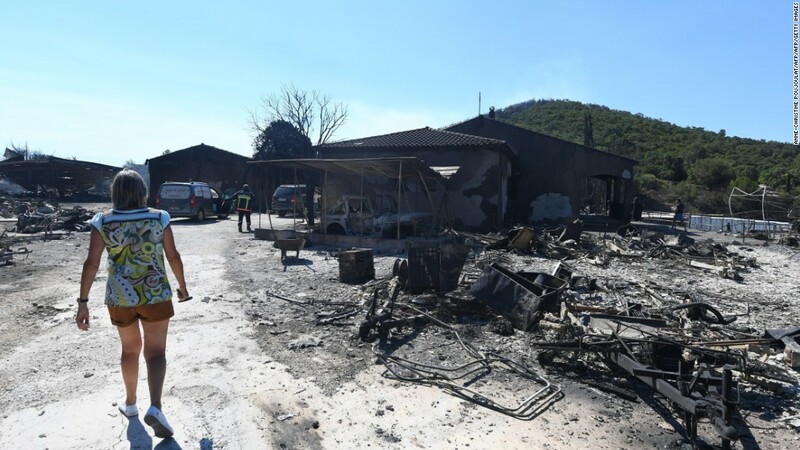 In Londes-les-Maures, fires began to burn just before 11 p.m. local time and, despite the dispatch of 540 firefighters, have not yet been brought under control. 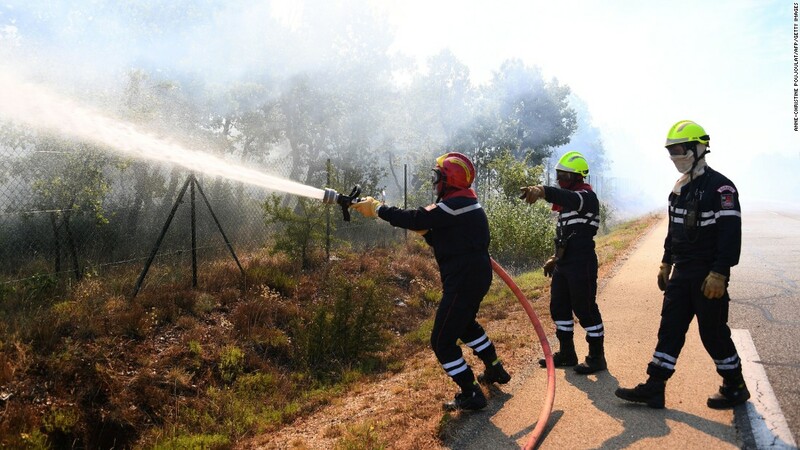 The areas of Croix-Valmer, south of the famed resort of Saint-Tropez, and Artigues, east of the regional hub of Aix-en-Provence, saw hundreds of hectares — around 12 square miles — of land burned but those blazes are under control, the statement says. A total of nine firefighters working on those two fires were injured. In all, more than 4,000 firefighters and soldiers have been deployed to the region, France’s Interior Ministry said in a statement. President Emmanuel Macron shared his support for the firefighters battling blazes on Wednesday. “Admiration and courage for those who are fighting tirelessly against the fire ravaging some of our territories,” Macron said on Twitter.